MURIEL HERBERT (1897-1984): The Lost Nightingale, JOHN IRELAND (1879-1962): Earth’s Call, The Three Ravens, THOMAS DUNHILL (1877-1946): The Cloths of Heaven, HERBERT HOWELLS (1892-1983): Goddess of Night, FRANK BRIDGE (1879-1941): Journey’s End, Where she lies asleep, Come to e in my dreams, BENJAMIN BRITTEN (1913-1976): Charm of Lullabies, Op. 41, A Sweet Lullaby*, Somnus, the humble god*, ARTHUR SOMERVELL (1863-1937): Into my hear an air that kills, GUSTAV HOLST (1874-1934): Journey’s End, Op. 48/9, HUBERT PARRY (1848-1918): Weep you no more, sad fountains, CHARLES VILLIERS STANFORD (1852-1924): A soft day, Op. 140/3, CECIL ARMSTRONG GIBBS (1889-1960): Sailing homeward, E.J. MOERAN (1894-1950): Twilight, IVOR GURNEY (1890-1937): Thou didst delight my eyes, The fields are full, All night under the moon, REBECCA CLARKE (1886-1979): The cloths of heaven, MICHAEL TIPPETT (1905-1988): Songs for Ariel, MARK-ANTHONY TURNAGE (b.1960): Farewell*. * - <First Recordings<. Description: This nocturnally inspired recital spans over 120 years of British song from Stanford to Turnage, and includes world premieres of two songs by Benjamin Britten, marking Sarah Connolly’s Proms recital debut, the centenary of Hubert Parry’s death, and British composers in general, who studied or taught at the Royal College of Music. Texts included. 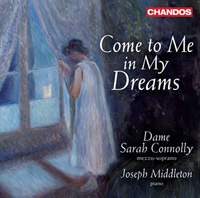 Sarah Connolly (mezzo), Joseph Middleton (piano).